Red Dot Brewhouse — Punch Design Co.
Red Dot Brewhouse in Singapore is one of the premier specialty craft beer producers in the region. Putting the customer's focus on the brand name was a day-1 goal, hence the gigantic red dot, but developing a brand reminiscent of 1940's American sentiment grew organically out of the process. 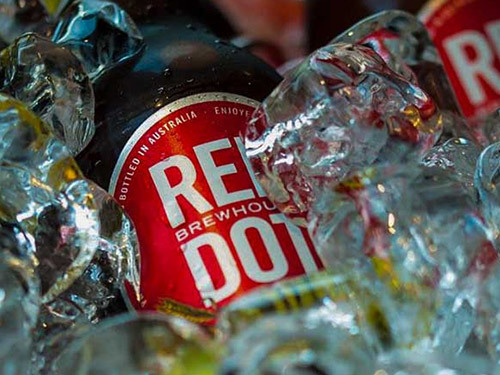 Due to the increased attention Red Dot Brewhouse began getting from American and other international customers, they began planning an aggressive packaging rollout. This is the ideal time for to strategically revisit a brand portfolio, and we worked with the Red Dot ownership to strategically refine, redesign and ultimately reignite the brand. Red Dot's market is dominated by Tiger and Asahi, among a few other large Chinese and Australian brands. This presents an interesting challenge, as the craft movement is not yet as evident in Singapore as it is in the United States, Canada, and parts of Europe. Many, many different directions were developed before we hit on a classic solution that was the right blend of "big and professional" and post-war nostalgia for their new, western clientele. We worked with colored pencil artist Linda Fennimore to develop the beautiful dot, banner, and greenery that adorns every label and package. Together, the new brand system aligns the full Red Dot portfolio, prepares the company for future growth and future products, and ensures a memorable, cohesive brand identity that drinkers—Singaporean or American—will never forget.